Short preview this week as I've been insanely busy at work. Here's the deal: Arsenal are eight points out of the top spot in the league and have a winnable run of fixtures: Swansea away, Burnley at home, and Watford at home, before a big showdown at Stamford Bridge. Win all three and we'll talk about title hopes going into that match. Win in West London and then we're really in business. Continue stumbling and who knows what we're focusing on by mid-February. Okay, still a lot going on here, so let's focus: Danny Welbeck came back against Preston last week, so he's off the injured list for the first time since May. Arsenal were without Laurent Koscielny, Alexis Sánchez, and Lucas Pérez through knocks and rest last week, and as far as I know, all of them should be returning. Will we see Mesut Özil for the first time in 2017? I certainly hope so. How about Hector Bellerín, who played hurt against Bournemouth? How about Kieran Gibbs, out since Boxing Day? Or Theo Walcott, out since before Boxing Day? I believe all three will face some fitness tests, and will have to stay in the doubts column. Predicted XI: Čech, Bellerín, Koscielny, Mustafi, Monreal, Xhaka, Ramsey, Iwobi, Alexis, Özil, Giroud. Jefferson Montero, who has terrorized Arsenal in the past, is out until the end of the month with a hamstring injury. Meanwhile, Neil Taylor has a fractured cheekbone, which will require surgery. Modou Barrow is a major doubt, having suffered an injury during an Under-23 match recently. Predicted XI: Fabiański, Naughton, Fernández, Mawson, Kingsley, Britton, Cork, Fer, Routledge, Sigurðsson, Llorente. Since Arsenal lost to Southampton in the League Cup, snapping their unbeaten run at 19, their form has been all over the map: W-W-W-L-L-W-W-D-W. No major stretches without wins, yeah, but they've dropped eight points in the league over the last month. Incidentally, Arsenal are currently eight points out of first. Funny how that works. Meanwhile, it has been a dreadful season for Swansea City, yet they are only one point from safety. In fact, they've won three of their last eight! Not bad, since they had gone 11 in the league without a win during that time frame. They did, of course, lose their FA Cup tie to Hull City, 2-0, last weekend. However, since that's a relegation six-pointer in league play, perhaps it's best for the Swans to be the team left focusing on their league survival after the first hurdle. 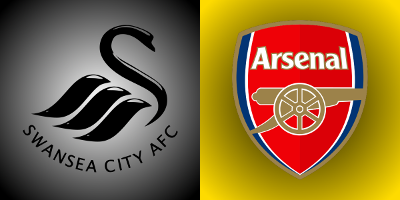 Arsenal won the reverse fixture 3-2 at the Emirates in October, but the Gunners have yet to pick up all six points against Swansea in a given season since the Welsh club's promotion in 2012. At the Emirates, Theo Walcott scored twice to give Arsenal a 2-0 lead, but Gylfi Sigurðsson pulled a goal back for Swansea before halftime. Mesut Özil restored the Gunners' two goal lead, but Borja Bastón made it 3-2 on 66 minutes and Granit Xhaka was sent off on 70. Arsenal had to hang on for 20 minutes and change to get the three points and hand American manager Bob Bradley his first of many losses with the club. As for Arsenal's prior record against Swansea, well, as I mentioned, they've never won both league fixtures in a given season. In 2012/13, Arsenal won at home but lost in Wales. In 13/14, a late Mathieu Flamini own goal gave the Swans a point at the Emirates after Arsenal won at the Liberty. In 14/15, Swansea came back from 1-0 down to win 2-1 at home, before losing in London. Last year, Arsenal had a dreadful first half in Wales, but ended up with a comfortable 3-0 win. Olivier Giroud, Laurent Koscielny, and Joel Campbell all had second half goals for the Gunners. The referee is Chester-based Sting-lookalike Mike Jones. Arsenal have seen Jones once so far this season, for their 3-1 win over Bournemouth at the end of October. Jones did not have a great match that day, however, giving the Cherries a pretty borderline penalty in the first half. Arsenal won three of the four matches that Jones worked for them last season, including a 3-0 win at Watford, a 4-0 win over Hull City in an FA Cup replay, and a 1-0 win over Norwich late in the season at the Emirates. The other match, however, was the 3-3 draw at Anfield in January. Arsenal's last loss with Jones in the middle came in 2014 at Stoke City, which the Potters won 1-0 on a borderline penalty for a Laurent Koscielny handball. Swansea have also seen Jones only once this year, losing 1-0 to Southampton at St. Mary's on September 18. Last year, Jones worked a 2-0 Swansea win over Newcastle as well as a 2-1 loss to Tottenham. John Painting is a contributing writer to the Modern Gooner and a French documentary about birds. You can follow him on Twitter @zorrocat pour français, s'il vous plaît? Yes, I have started getting these by clicking "Random article" on Wikipedia.